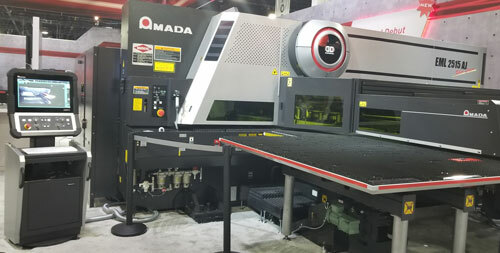 Amada’s expansive booth included a host of recent equipment introductions, including the EML-2515AJ, a servo-driven punch/3-kW fiber-laser combination, which offers high-speed cutting and 300-kN punching force. The combo machine, configured for large-format working areas, offers an increase in stroke frequency of as much as 25 percent as compared to previous offerings, as well as higher speeds, reaching 50 m/min. These improvements are achieved with considerably lower energy consumption than via a CO2 laser. The machine also features an integrated nozzle changer. This reportedly enables continuous production by eliminating manual setup. A punch and die changer allows automatic tool setup. Amada also detailed V-Factory, its IoT-driven remote support service. It employs IoT technology to link machinery and provide real-time monitoring and adjustment. With V-Factory, machines, tooling and software can collect data, integrated into a safe and secure environment at Amada through a V-Factory Connecting Box. The company’s newly established IoT Support Center serves as a contact point with users. Through this link, Amada provides measures for preventing production stops as basic support, as well as other support options. These include back-up measures during emergencies, and use of ‘big data’ to improve production efficiency. V-Factory also supports predictive-maintenance strategies, to help prevent unexpected machine stoppages and to ensure supply of needed spare tools and parts. Also, in addition to data and programs for manufacturing, parts-development charts and drawings are backed-up and securely stored. The support service compares a user’s production plan and actual performance while probing and identifying causes of discrepancies between the two. The support service’s My V-Factory web- and app-based tool enables real-time communication from anywhere regarding preventive and corrective maintenance, and provides for quoting machine tools and parts while managing a history of quotes and orders.